In 1835 northern chiefs signed a Declaration of Independence, asserting their sovereignty over New Zealand. The declaration had been drafted by a British official, prompted in part by rumours that a Frenchman was planning to declare himself the king of New Zealand. In the early 1800s, before New Zealand was a British colony, many European traders, whalers and settlers arrived here. Because of concerns about the behaviour of some Europeans, and the lack of laws to govern them, the British government appointed James Busby to be an official ‘British Resident’. Busby arrived in Waitangi, in the Bay of Islands, in 1833. Ships needed to fly a flag of a country, but New Zealand didn’t have a national flag and a New Zealand-owned ship had been seized in Sydney for not flying a flag. In March 1834 Busby called together chiefs in Northland to decide on a flag. They were presented with three options, and the one they chose became known as the United Tribes’ flag. Busby hoped this might encourage different tribes to work together. In the 1830s the British were concerned that France or the United States might try to claim New Zealand. Because of this, in 1835 Busby, with help from missionaries Henry Williams and William Colenso, drafted a statement for chiefs to sign in which they declared themselves rulers of New Zealand. The version that was signed was in Māori, but an English translation was also made. The second stated that the ‘kingitanga’ (sovereign power) was held collectively by the chiefs. Other chiefs signed the declaration up until 1839. 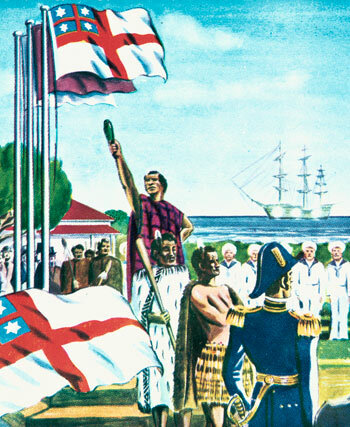 In 1840 the Treaty of Waitangi was signed and New Zealand became a colony of Britain.